This homemade pickle relish I made from cucumbers and onions. When I made it I was not expecting anyone to like it, in fact adding cucumbers to onions and then making a relish sounded a bit too much like the mad scientist kitchen recipe. Luckily, the girls enjoyed it since hubby had gone on a trek he did not get a taste of it. When it comes to food then, “A relish is a cooked and pickled product, made of chopped vegetable or fruit; as a food item typically used as a condiment, in particular, to enhance a staple.” Courtesy Wikipedia. In North America, relish is green, pickle or dill relish, made from finely chopped pickled cucumbers. 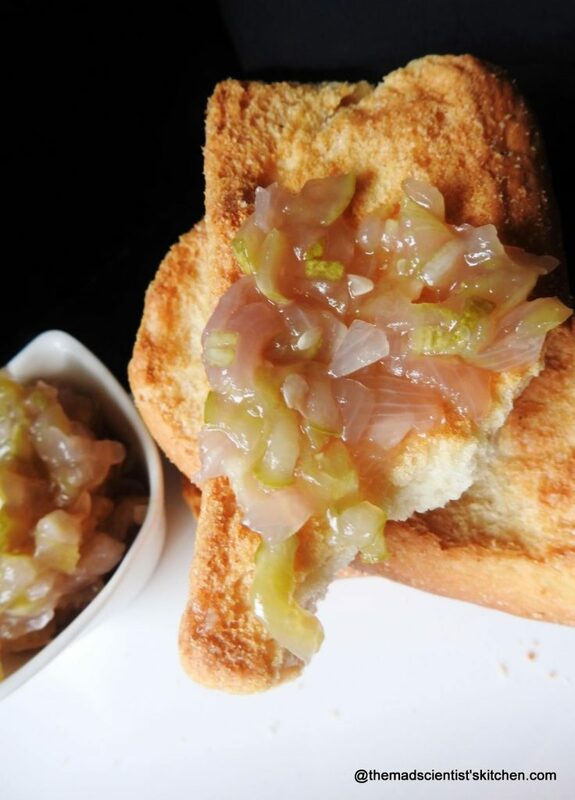 A relish can be a condiment as well as an ingredient for other condiments. 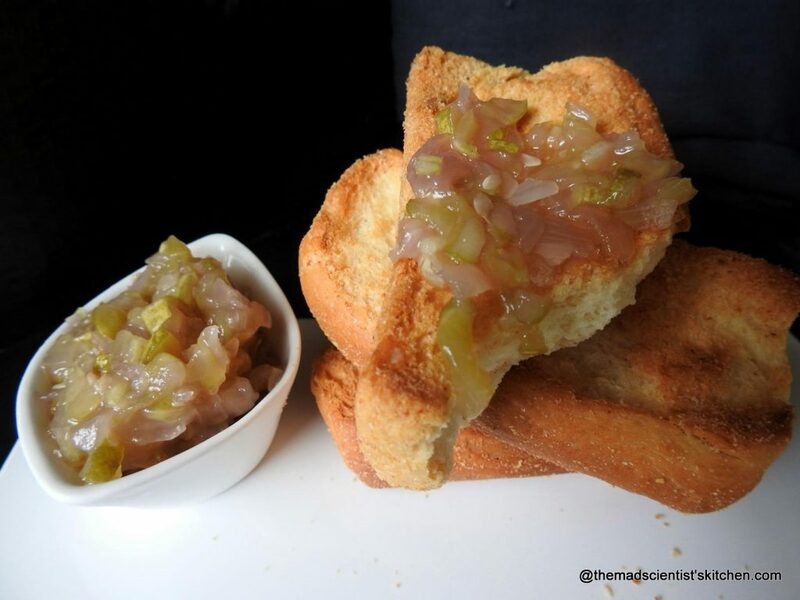 I expected to see chutney as an example of relish but was surprised that examples of relish include jams. Both sauce and relish are made from fruits and vegetables. The difference between sauce and relish is that in a sauce is smooth. 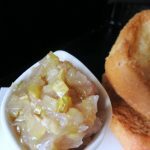 A relish may be sweet or savoury, hot or mild, but has a strong flavour that complements or adds to the primary food item with which it is served. In the United States, generally commercial pickles are made from pickled cucumbers and are known as pickle relishes. Two variants are hamburger relish and hotdog relish. Talking about relishes how can we forget Gentleman’s Relish, which contains spiced anchovy that is eaten spread sparingly atop unsalted butter on toast? Now adding homemade pickle relish, which I have made from here. I reduced the quantity by 1/4 but the quantities here are as in the original. This relish keeps when kept refrigerated for 1 month. Mix well the onion, cucumber and salt, set in a sieve. Let the mixture drain for 3 hours. After 3 hours discard the liquid and squeeze out as much liquid as possible from the mixture of onion and cucumber. Mix the cornflour and water. Set aside. In a heavy pan, boil the vinegar and sugar until the sugar dissolves. You will have to stir the contents continuously until the sugar dissolves. (I prefer to use steel for this job). Continue boiling until the vinegar reduces to 1/2 cup. Add the onion and cucumber mixture and simmer. Keep stirring. Say for 2 minutes. Stir the corn flour and water. Add to the relish and simmer for a minute stirring continuously. Transfer relish to a bowl and chill, uncovered, until cold, about 1-1/2 hours. This relish can be preserved in the fridge for 1 month. The cuisine of USA is something that my girls like and hence my choice for BM this month. Add the onion and cucumber mixture and simmer. Keep stirring. Say for about 2 minutes. Relish keeps, chilled, 1 month. Pickle relish looks yummy to try. 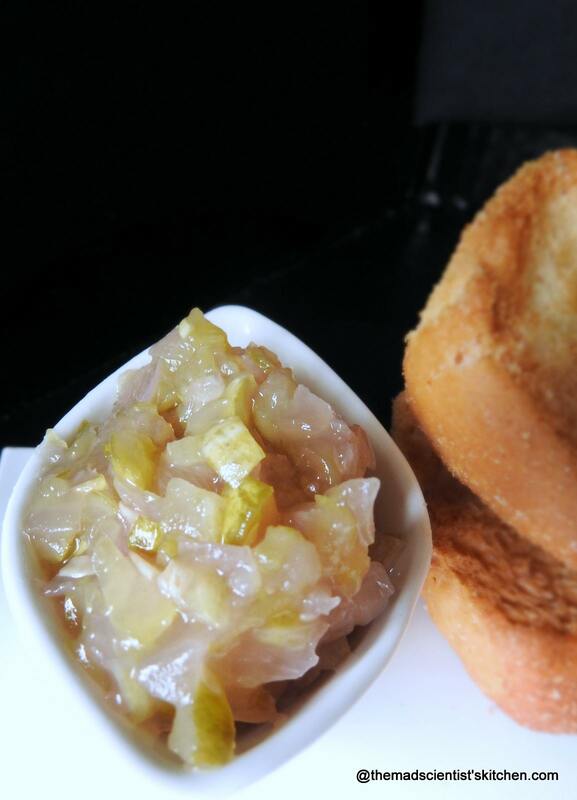 Tangy and delicious pickle relish. Didn’t know that it is that easy to make at home. Am sure this pickle relish will definitely tickle my tastebuds. Never tried this way. I have some white vinegar. Will definitely try this. I love relish on anything. Sandwich, parathas, or tortillas, I love it with relish. Great recipe Archana. Sounds interesting Archana , should go well with sandwiches . This is a good condiment to have on hand. Sounds easy enough to make, too. My husband loves relish and thanks for giving the details. I always used to wonder what is so special about relish. I usually stay away from this but would love to try it out for my better half. Never heard of this combo! My take your advice and try it out sometime.And you seem to have a nice collection of relishes on your blog Archana!